The MINI John Cooper Works GP III is coming with 300bhp and the Golf R should be scared. MINI claim the new John Cooper Works III will have “more than 300bhp” and will be on showroom floors in late 2019. Wrapped in camo in the spy shots above, it's clear to see it sports aggressive aero, chunky flared wheel arches and more dynamic bodywork, which makes it pretty obvious that this is the new JCW flagship. 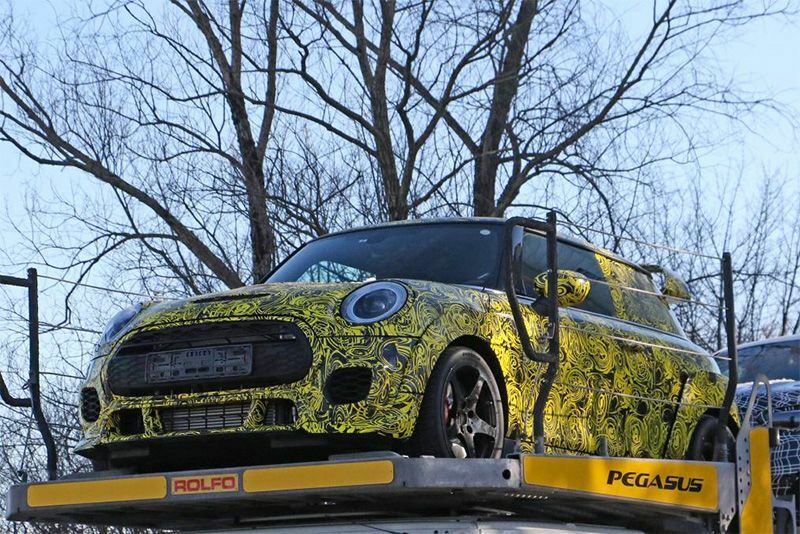 Under those large arches sit bigger wheels on wider, circuit-based front and rear tracks, although the official images from MINI show four spoke alloys and not the five-spoke ones on the test mule in the spy shots. It also has a comically large rear wing sitting on the top of the boot lid. According to MINI, 3,000 units will be produced and all will be fitted with a turbocharged four-cylinder engine with more than 300bhp. They have also said it is inspired by 2017's John Cooper Works GP Concept and, as such, besides the wider track and functional aerodynamics, will likely receive upgrades of the current JCW in the form of reworked suspension setup, bigger brakes and a new differential. We reckon, to achieve MINI’s claim of “more than 300bhp”, there'll be a larger turbocharger, a new intercooler system and reworked exhaust, and expect it to have shed some weight, by losing the rear seats among other things, over the standard car. It sounds awfully exciting and a battle with VW's Golf R is a tantalising prospect, watch this space. Video: 16vampir Golf 2 Awd – Hypercar Destroyer! Golf Is Going Where No Other Golf Has Gone Before!